Difficult situations often take us on an emotional roller coaster. When times are good, we can usually feel comfortable in our knowledge and understanding of God’s Sovereignty (meaning that God is in complete control). However, when we go through serious trials in life, sometimes we can lose sight of this. It can be quite easy to get completely wrapped up in our problems, and to let things like fear and worry consume our minds. If we give these emotions too much headspace, they can send us down the path of all kinds of wrong-minded thinking. We may find we are almost developing a sense of entitlement (I’m a Christian, therefore God should make sure my life is good), or a condescending type of doubt (If God is supposedly in control, why doesn’t he “fix” this), or maybe worst of all, arrogance (I have my own plans, I know what’s best in my life, and this situation isn’t in alignment with that). And so, when we are in the midst of storms in our lives, we may find ourselves asking “Where is God?” However, I think we can begin to get in a better mindset if we understand there is a difference in questioning where God is in a situation, as opposed to asking if God will reveal himself. I feel the former question, if we aren’t careful, can come from (or even build up) some of that wrong-thinking I mentioned above. The latter question, however, firmly plants our feet on a solid biblical foundation. By asking if God will reveal himself, baked-in to that question is the presupposition that God is already right there with us—we just don’t see him. It sets up our acknowledgment that what is happening is well within God’s control, and that it’s part of a much larger plan. I’m certainly not claiming its always a breeze, as often that larger plan may not be visible to us. However, sometimes God puts the pieces together in such an obvious way, it slaps us in the face and we can’t help but praise him in our storm (somebody cue Casting Crowns). This was the case for me recently. As some of you may know, a couple of weeks ago my position was eliminated where I worked, and I found myself unemployed. It came at a particularly challenging time in our lives, as numerous other mini & moderate storms had hit over the past couple of months. While there were obviously some of those roller coaster emotions I talked about earlier, I (for some unbeknownst reason to me) had this deep down underlying peace about it. In losing my job, the one thing I obviously had no clue about was how (literally) life-saving this event would be. After about a week at home, I figured I’d go ahead and get some things done I had been putting off because of how busy I had been. I started on a few projects around the house, and I scheduled numerous appointments like the dentist, my eye doctor, etc. Since I was getting my eyes and teeth checked out, and since I had the time, I thought I might as well try to schedule my cardiologist and see if he had any ideas on my chest pain. I couldn’t get on his schedule anytime soon, but they did set up an appointment for me to meet with his physician’s assistant. After our initial consult, she thought I should get a stress test as a next step, and it was scheduled two days later (Thursday, Dec 13th, 2018). That morning I failed the stress test, bad. I couldn’t even get my heart above 130 because of how short of breath I was. Previously I thought shortness of breath was something like the heavy breathing you get after intense exertion. Yeah, well, I now realize it’s not like that at all. This kind of shortness of breath is more like you are drowning. It’s a terrifying feeling and brings with it a very difficult to describe type of intense pain. Since I couldn’t complete the test on the treadmill, they used something called Lexiscan, which is an injection that increases blood flow in the arteries to simulate the workload on your heart. And while I felt like that was going to kill me when it was injected, it did (along with a couple rounds of imaging) allow them to get the data they needed. About 10 minutes later, after reviewing the results, their doctor brought me the first of what would end up being several upcoming “tough conversations.” He told me 50 percent of my heart was not getting blood. (Note that’s not 50 percent blockage; it means a critical blockage that is affecting half my heart.) He set up an appointment with a Cardiologist two hours later, and they ordered for me to have a heart catheterization ASAP. We waited in their offices for over four hours, but there were no rooms available in cardiac, so they ended up admitting me into ER. That next morning they got me in for the procedure. After the heart catheterization, since I was still in la la land from the sedation, Mindy (my wife) got to hear the second of these tough conversations. They diagrammed four serious blockages—70%, 90%, 95%, & 100%. 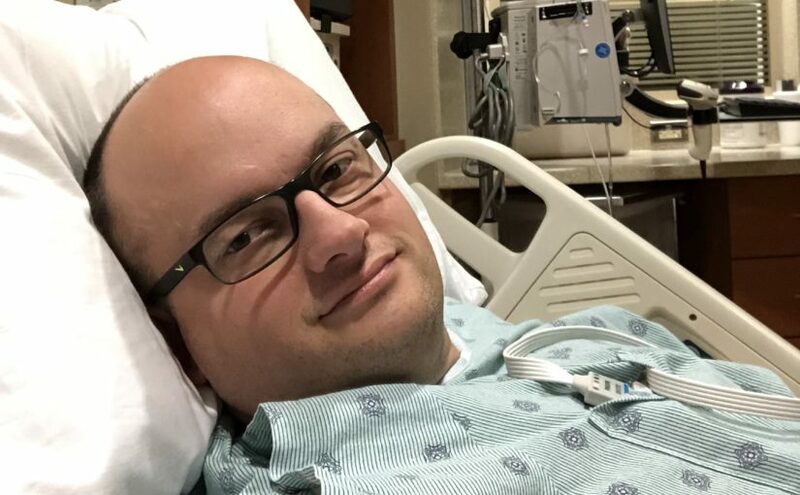 They filled me in on it later, along with the last, and definitely the toughest news–I was scheduled for a triple bypass surgery on the morning of Tuesday, December 18th! (Two were on the same artery, so that’s why its not a quadruple.) Based on my numerous health struggles, I’ve always assumed this would be in my future, but I never expected it at the age of 45! They told me not only was I a “ticking time bomb” to have a heart attack, but with the 50% of my heart not getting blood, I wouldn’t have survived. Enter your email address and you will receive updates when I post new articles! Understand. Know we are praying for you all. Hugs Mindy. I will watch further for your blog. Wow. God’s plan is perfect. Praying for a super successful surgery and a smooth recovery. I’m so glad for you and your family that this was found. I’m actually scheduled for my date January 11 at St. Francis. Been waiting since my teen years. At 46 it’s time. OHS, repair my aortic valve and replace my dialated aortic root. God’s got this for you and me. I’m so thankful that we can both be healed by our docs. God bless! Love ya, Mayo. Praying for a successful outcome tomorrow. My prayers go out for you!!!! Believe and Receive!! Praying for Gods blessings in you! Loved the blog!! First I must say your are a incredible writer. I was given a picture several years ago from a dear family member with the words “Be still and know that I am God” psalm 46:10. I have it in my closet where I see it everyday, and have for over 20 years. It truly had helped me through many hardships in my life. It is amazing how our Lord works, and you are a true testament to this. My prayers are with you and your family Brian. Brian, we are praying deeply for you and your family. I appreacite your candor and know how God rides these storms right by your side. Bless you for feeling this same peace / strength and sharing it with everyone. We often need those reminders from someone else’s story. Brian! Praying for the doctors to do their best work tomorrow, speedy recovery for you and peace for your family! Excellent post! I pray your surgery goes well and that you have many more days to seek after the Lord! One thing’s for sure, when you seek him you will find him. Keep us all updated on your progress. I understand it’s scary I’ve been going three heart problems the last year and they still have gotten to the bottom of this. I am praying for you as surgery is today! I taught with Mindy nail I retired June 2018. Your family is important to me. Thank you Brian. Your perspective is encouraging and convicting. Praying for you, Brother. Thank you for posting this, Brian! I didn’t know you that well or for very long as I started with FCTucker just last year, but this post really hit me. I had an episode where I had a “baby” heart attack about 4 years ago and I was asking God the same questions. Even the “reveal yourself to me” question. But I never received an answer. I never found out why things were happening. Then I realized that God wants me to trust him and I wasn’t demonstrating trust if I was asking why. I just needed to trust and rest in the knowledge that He knows best. It is for my good, and that might be the only reason – for me to learn to trust God with my life, fully relying on Him no matter what is happening, leaning not on my own understanding. I think you might’ve quoted Proverbs 3:5-6, such a blessing to know God is worthy of our trust! I so love this and can relate. Wishing you the best. Write on. Brian, that is a very powerful blog post. Thank you for sharing. Your faith is strong and contagious. You are in my thoughts and prayers as you face surgery today and in the days, weeks and months ahead as you recover. God Bless you and thank you for sharing your story! Today is the day of your surgery and am praying God will bless you with a successful and short recovery. Outstanding! So glad I took the time to read this. Praying for you brother. I thank you for these beautiful thoughts. I thank our merciful Savior for keeping you with us.